Tullamore Dew is a smooth, mellow whiskey that is a blend of Pot Still and Grain Whiskeys which are presently distilled in Midleton Distillery in County Cork. On the nose, a mild blend of spicy, lemony and malty notes, with charred wood and vanilla undertones. Light bodied, sweetish spices, buttery and rounded with light citrus fruitiness. Nose On the nose, a mild blend of spicy, lemony and malty notes, with charred wood and vanilla undertones. Palate Light bodied, sweetish spices, buttery and rounded with light citrus fruitiness. The palate has a warming, pleasant maltiness with toasted wood and vanilla hints. The finish is smooth and gentle, the complex flavours lingering. Serving Suggestion The Barmbrack is true Irish Soul Food. It's the loaf's candied, warm, nutty notes which we’ve taken to inform the flavour and texture of the Tullamore D.E.W. Barmbrack. We’re great believers in the saying ‘You only get out what you put in’, and, when you see how much goes into a Barmbrack Sour, you’ll know what sort of pleasure to expect drinking one. 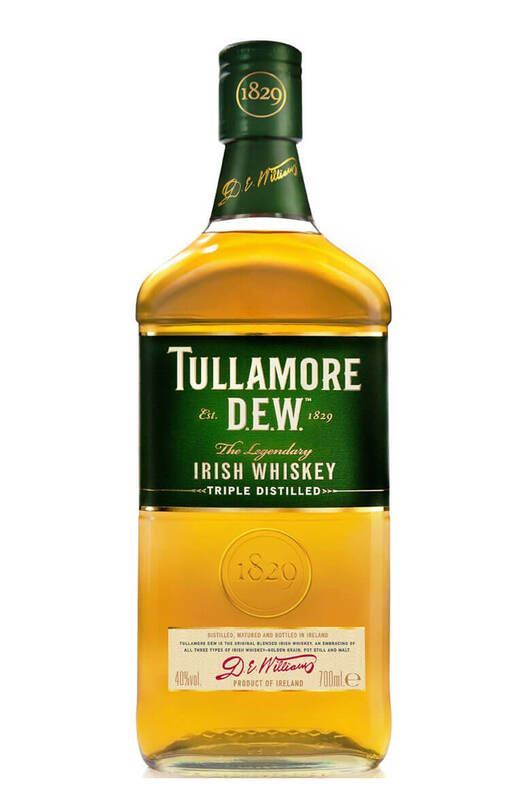 METHOD Add 50ml Tullamore D.E.W. Original, 1 barspoon quality apricot jam, 20ml fresh lemon juice, 2 dashes Angostura bitters, 15ml egg white and a pinch of cinnamon to shaker. Dry shake without ice then add ice and shake hard. Fine strain into a chilled coupe glass and garnish with crushed toasted pecans and a light dusting of freshly-grated nutmeg. Double Gold Medal 2008 San Francisco World Spirits Competition. Gold Medal Winner 2008 International Wine & Spirit Competition.